One of the benefits of solar energy is lower electricity bills. Because the electricity generated from the sun is FREE, and solar leases are locked at a fixed monthly rate, switching to SolarJoy from high variable cost energy companies saves you money and provides peace of mind and wallet. The United States Energy Information Administration has stated that energy costs have risen 50% from ten years ago alone — so it pays to lock in low rates with solar! Purchasing clean energy through SolarJoy's solar lease program allows homeowners the advantage of not having to worry about any maintenance on manufacturer defects, nor deal with annual insurance costs. 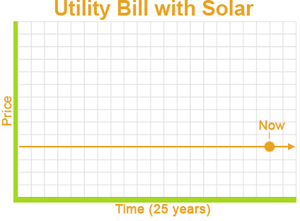 SolarJoy GUARANTEES the system performance will help the homeowner save money on electric costs. Solar energy is generated by the sun. The solar panels we place on your home convert the sun's energy into electricity. Thus, one of the advantages of solar energy is that this process is clean, no waste is produced, and you are helping to reduce pollution with zero carbon emissions. Traditional electric and utility companies generate electricity by building infrastructure that is massively harmful to the environment in order to bring homeowners usable electricity — and destroy non-renewable resources at the same time! Take a look at Business Insider's "The 15 Worst Companies for the Environment" — no surprise that they are almost all traditional energy companies. To enjoy the benefits of solar energy, don’t wait — Request Your Free Quote Now! High Cost: Consumers don't pay a fixed price for energy. For most utility companies, the more energy a person consumes, the higher the price per fixed measurement of energy. This is typically the reason why our energy bills are higher during the summer and winter. High Pollution: Utility companies typically generate energy through power plants that run off of a variety of fuels, such as coal, fossil fuels, uranium, and other non-renewable fuel sources. The non-renewable fuel is almost always very harmful to the air we breathe as the process to extract energy out of these fuel types is to burn them. LOW Cost: Because the electricity generated from the sun is FREE, one of the pros of solar energy is that homeowners may now be offered a lower cost of electricity! Let's say Bob is a homeowner, and Bob currently pays an average of $300 per month to his Power company. When Bob switches over to solar, he can pay as much as 30-50% less each month! The savings are huge and the monthly payment can be a fixed rate — so there are no surprises! NO Pollution: The only function of a solar panel is to directly convert the suns rays into a usable energy, without emitting anything into our atmosphere. Because the sun will never run out, unlike fossil fuels or coal, using solar panels effectively turns a home into its own clean energy generating power plant.